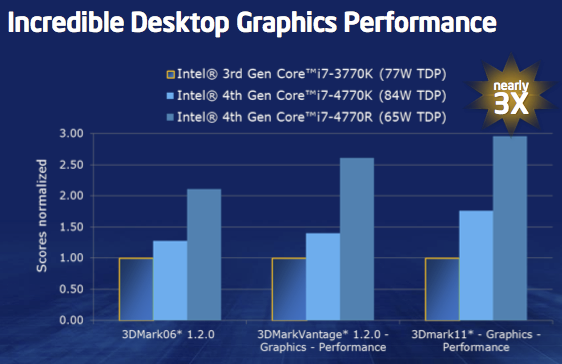 Intel’s Haswell GT3 graphics is the company’s first foray into making an integrated graphics core that can deliver “good enough” gaming performance. 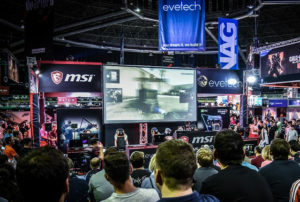 Intel’s Haswell will be released on 4 June 2013 at the same time that Computex Taipei opens its doors to visitors eager to see exhibits with new tech on display. 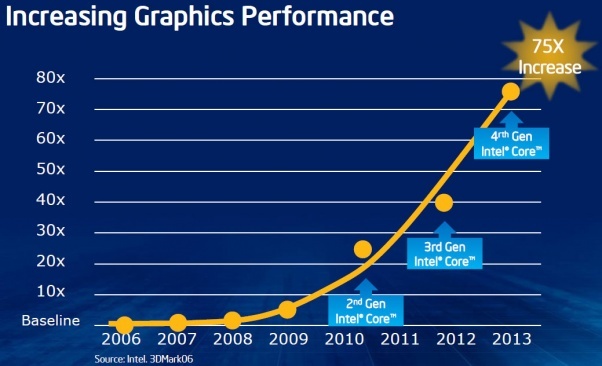 Haswell processor performance is expected to be only 10% faster than the outgoing product, Ivy Bridge, but will enable Intel to slip it in smaller and thinner devices thanks to improved power consumption and heat dissipation. 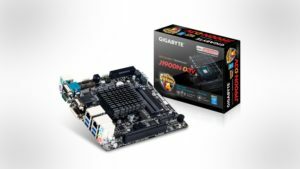 GT3 is the codename for a graphics core that Intel wants to package with select processors in the Core i5 and i7 range in a BGA package. Its primary destination is laptops and tablet computers, but you can also expect it to debut on the desktop as well alongside a multiplier-locked processor. 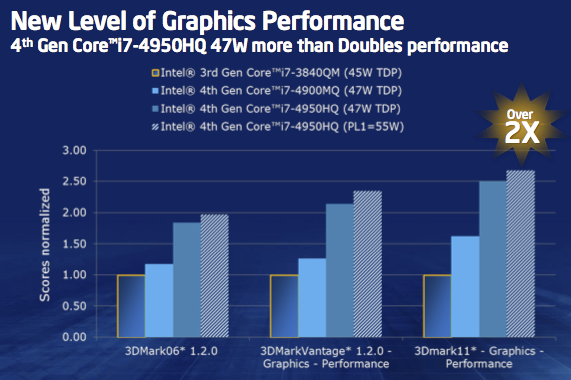 Now called Iris, Intel promises quite a few impressive performance boosts compared to their current HD4000 graphics. 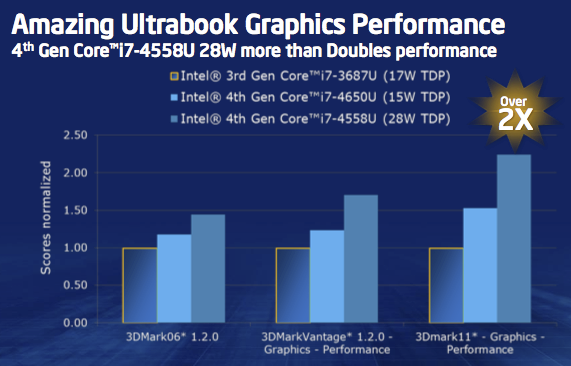 Iris is Intel’s first GPU aimed at gamers and is priced to compete against the GT640M found in laptops. It supports DirectX 11 and OpenGL 4.0 and has optional integrated eDRAM, much like the Xbox 360 Xenos GPU core, which enables extra graphical effects such as anti-aliasing and anisotropic filtering to be enabled without inducing a performance hit. 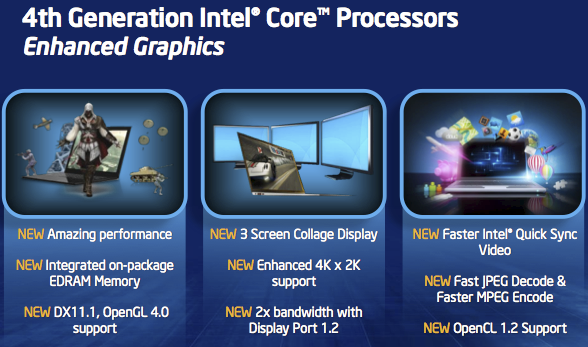 Intel also introduces Collage Display, their own version of AMDs Eyefinity and Nvidia’s Surround multi-monitor support. Collage display appears to only be targeted for the desktop, as mutli-monitor gaming on Iris wouldn’t be very good given its limited hardware resources. 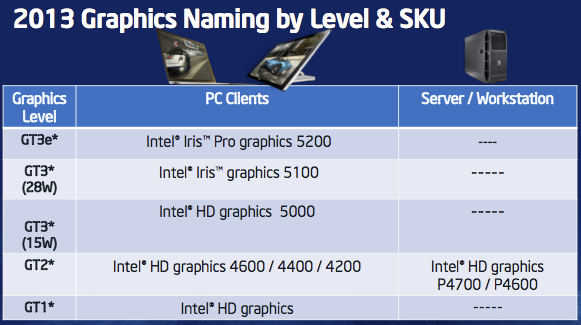 Intel also says that Iris supports 2K and 4K displays, the future replacement of 1080p for desktop users and professionals in the video editing and special effects market. Iris also supports the latest version of Displayport, delivering twice the available bandwidth to connected devices. Intel says that Quicksync is now faster because of the extra hardware in Iris and touts faster MPEG encoding, giving HTPC owners some love when transcoding videos to MPEG format. It also supports OpenCL 1.2, allowing OpenCL-compliant applications to use the execution units inside Iris to accelerate applications that require parallel processing or that benefit from it.